I usually make a big batch of it at a time, so this recipe can be divided for smaller batches. Boil pasta, drain, & rinse well. While boiling cut up the cheese, pepperoni, & artichokes. Mix together with pasta, olives, & add amount of dressing desired. (too much will make the pasta soggy). Refrigerate. 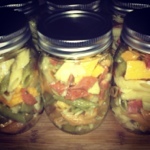 I like to fill up mason jars for a quick lunch for my husband to grab on his way to work!